La France was the team that raised up FIFA World Cup trophy Russia 2018. The score that end 4-2 against Croatia shows up the higer quality of France team. But France opened the score with an autogol of a Croatia´s player Mario Mandžukić . 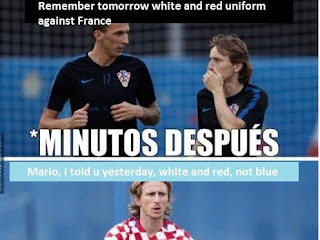 Media play with the fact that Croatia and France worn similar uniforms.